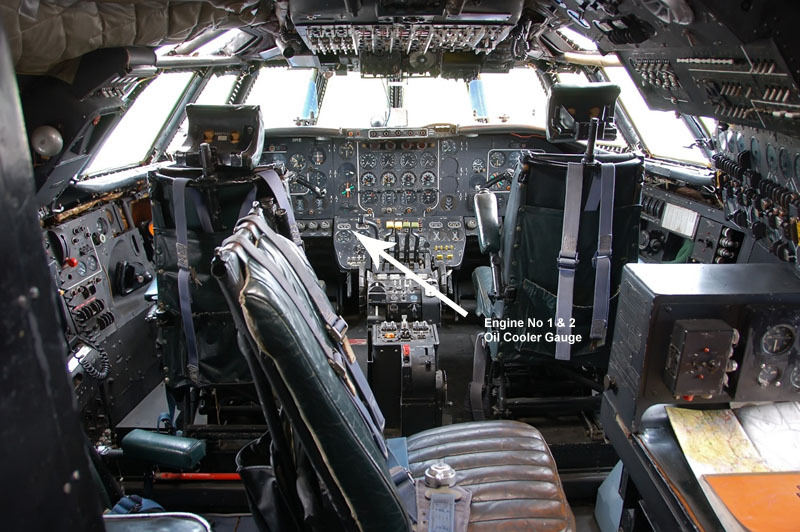 So back to the start for our Britannia, here are her details: - Bristol Britannia B175 Type 314, Serial Number 13453. 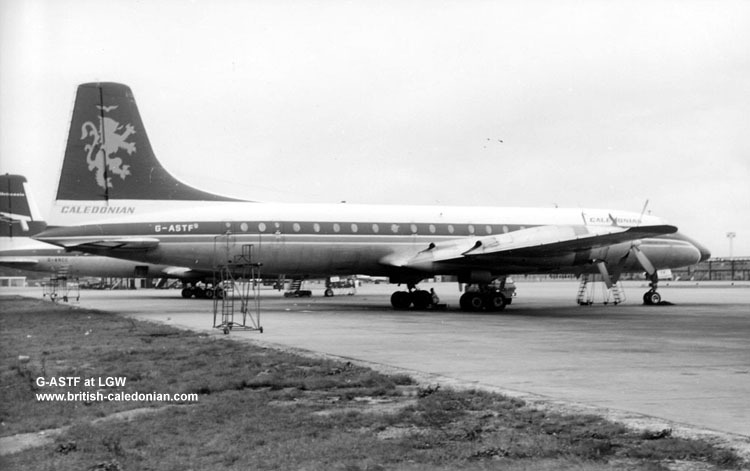 She was built in Belfast and was delivered to Canadian Pacific Airlines on 7th August 1958 and registered CF-CZW and named "Empress of Edmonton"
Caledonian Airways had been acquiring Britiannia's and at during the summer season in 1965 they had three in service (G-AOVH, AOVI and AOVJ), but plans saw the need for more Britannia's and three were aquired from Canadian Pacific. 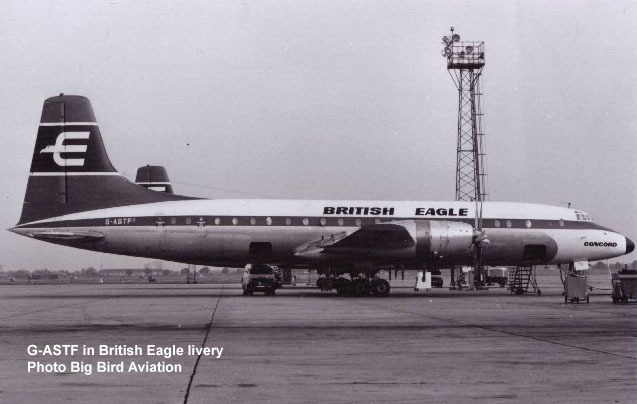 G-ATMA arrived in November 1965, our Britannia G-ASTF arrived in January 1966 with G-ATNZ. Our Britainnia would have flown on many Inclusive Tour Charters and Trooping flights on Caledonian service. 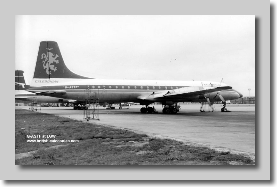 Though in 1968 she was renamed County of Perth and the mantle of Flagship bearer was passed on to Caledonian's Boeing 707 G-AVKA in April 1968. 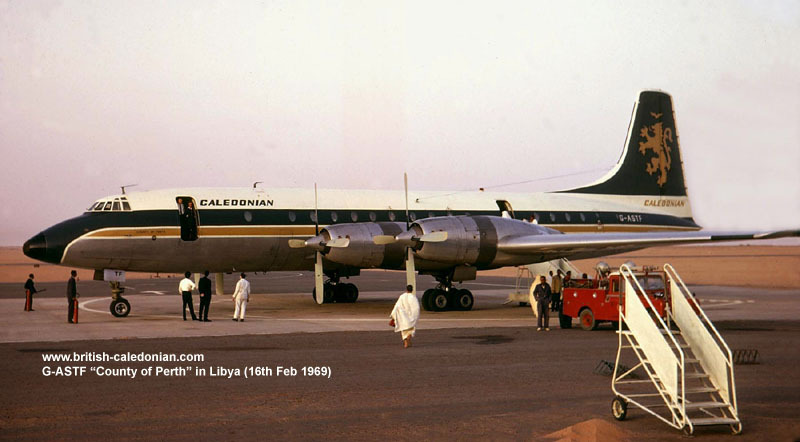 Caledonian's BAC 1-11's were due for the summer season in 1969, their 707's were plying the long haul routes and as the end of the 1960s drew near all airlines of status were promoting "all-jet" fleets, this was seen as a sign of progress naturally and hugley marketable. This of course saw the end of the Whispering Giant (as Brits were known) in many fleets, including those of BUA and Caledonian. 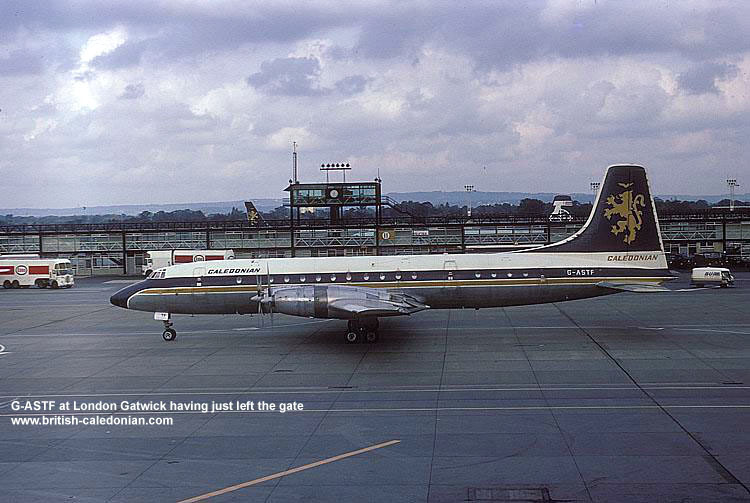 In November 1969 G-ASTF was placed into storage at Gatwick. Slowly parts were removed and thats were our Oil Cooler Gauge comes into play, the "fault" listed on the tag is "Aircaft Release". Lots of smaller airlines and freight carriers were still using Britannia's and would do for many years to come and spares would have been removed for sale / onward use afer testing. 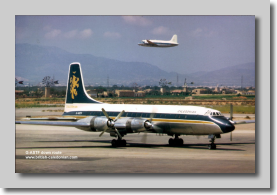 On 30th October 1970 G-ASTF was removed from the British Register, listed as PWFU, permanently withdrawn from use, and she was broken up at Gatwick. 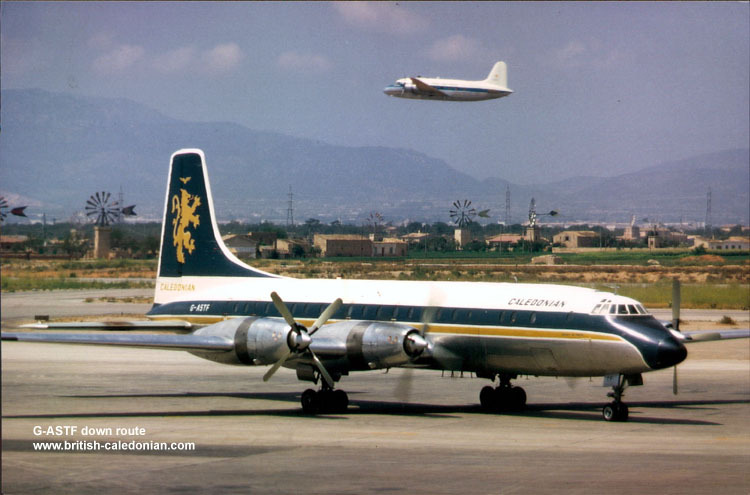 Caledonian's last Britannia G-ATNZ was withdrawn in November 1970 and finally sold to IAS Cargo in March 1971. 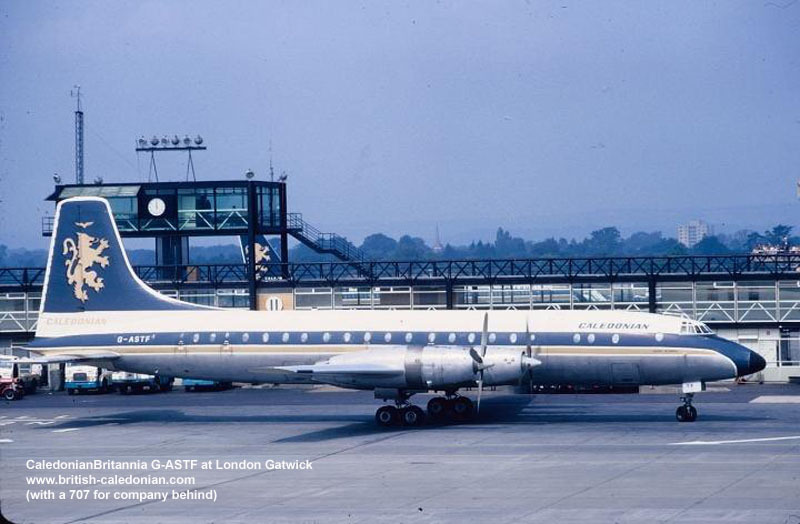 Okay, to start with above we have a super photo of G-ASTF at London Gatwick. It looks like her inboard engine is running / starting up and her nose wheel is turned out too. So where did this page begin.......well......all the way back in July 1970, the Friday 3rd July 1970 to be exact. Our Britannia was at Gatwick having her Engine No 1 and 2's oil cooler gauge removed. The gauge is a twin gauge, with two dials, one per engine. 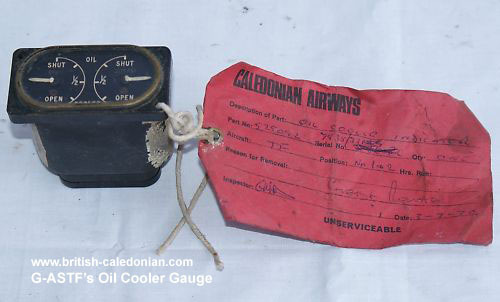 This all became apparent when the Oil cooler gauge and its Caledonian Airways unservicable tag appeared recently. Where has it been for the past 41 years? But it has found its way here and is shown to the right. 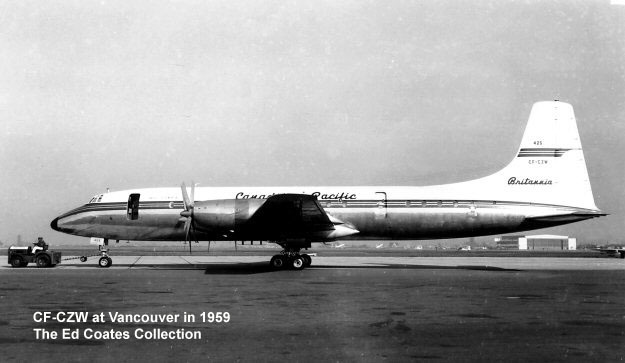 For the summer of 1964 she was leased from CP by British Eagle and was named "Concord". She arrived on the British Register on 20th May 1964, then returning to Canada on 15th October 1964, resuming service for Canadian Pacific. 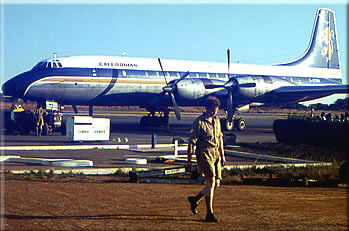 Caledonian assisted in the Zambian fuel airlift by carrying fuel supplies into Lusaka early in 1966 with Britannias. 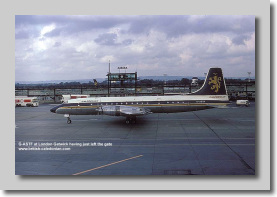 The first Caledonian Britannia left Gatwick on 28th December 1965, with 109 relief RAF crew on board, bound for Lusaka via Nairobi. They dropped the RAF personnel off and flew on to Dar es Salaam, where the seats were removed and the aircraft readied for carrying oil drums. 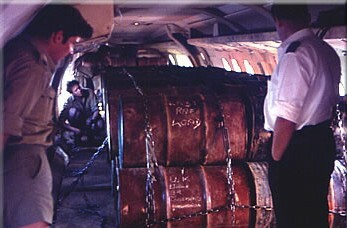 Each Britannia flight could carry 2,250 gallons of fuel in drums, whilst using 2,700 gallons itself on the return trip from Tanzania to Zambia. The actions of the then Rhodesian Government had left Zambia cut off from its main sources of fuel. In all Caledonian flew in 1,411,518 gallons of fuel, on 630 flights.